One man’s refusal to be de-humanized. It was with a mix of excitement and dread that I wrote down the courtroom where a federal judge would decide on Jan. 29 whether to release Ravi Ragbir from an immigrant jail. Just weeks earlier, I was shocked when agents arrested Ragbir during a routine check-in. Flipping my reporter’s notebook shut, I jumped on the subway with enough time to arrive early and get a seat at the hearing. It was a busy day, but I had learned a lot from Ragbir and felt dedicated to showing up. I also wanted to see if his refusal to be dehumanized had the same impact on the judge as it did on me. This was the first time I saw the strategy Ragbir would develop into an official accompaniment program that trains volunteers to join immigrants at their check-ins, in order to show ICE they have community support. The workshops have drawn hundreds of new allies to the basement of Judson Memorial Church, home of the New Sanctuary Coalition of New York, which Ragbir co-founded and now heads. After witnessing the anguish of immigrants and their loved ones in the check-in waiting areas, accompaniment volunteers often emerge with a new understanding of how broken the system is, and an outraged determination to stop their separation. 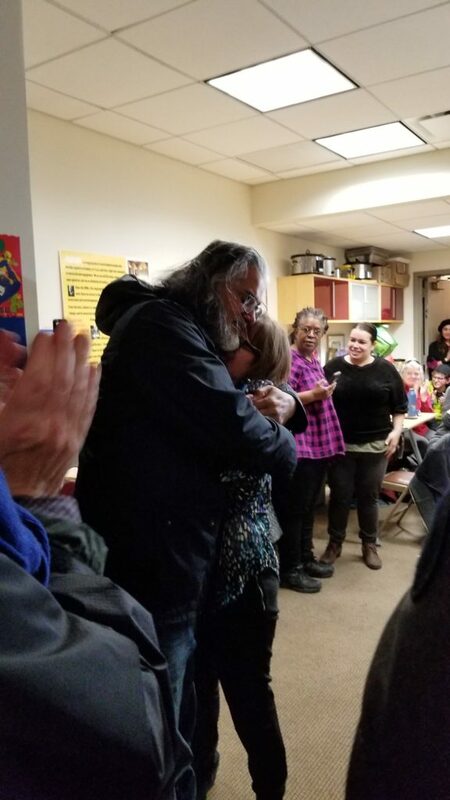 Ravi Ragbir is greeted by his wife, Amy Gottlieb, and supporters after being released from ICE detention. Credit: Will Coley. That outrage came to the fore when ICE detained Ragbir at his routine check-in on Jan. 11, handcuffing him in front of his wife and denying him a chance to talk to his lawyer, despite pending reviews of his immigration case and a challenge to his original conviction. The response was a mass protest by his supporters, including members of New York City Council. They were joined in their demand for his release by members of Congress, and then by the judge at Ragbir’s hearing on Jan. 29. The courtroom erupted in cheers as Judge Forrest said the way Ravi had been detained was “unnecessarily cruel,” seeming to acknowledge what I and so many others have witnessed while reporting on Ragbir and accompanying him and other immigrants at their ICE check-ins. Within hours, Ragbir was released. He welcomed his relative freedom after more than two weeks “locked in a box, in a cage.” But he said he was clearly targeted because of his activism, along with several other immigrant leaders nationwide. After accompanying Ragbir to his last check-in with ICE, lawmakers ­— including Councilmembers Ydanis Rodriguez and Jumaane Williams, who were arrested protesting his detention — are calling for him to be granted a “permanent presence in the United States” that would relieve him of the check-in ordeal. His Defense Committee and lawyers will ask ICE to extend his current stay of deportation on Feb. 9 as they continue to appeal his case. Meanwhile, the New Sanctuary Coalition’s next accompaniment training is scheduled for Feb. 26. The New Sanctuary Coalition aims to activate congregations and other allies in their “accompaniment program,” and offers a weekly legal clinic to help those facing deportation manage their cases. For more information visit NewSanctuaryNYC.org or call 646-395-2925. This is reader-supported news. Make a contribution. 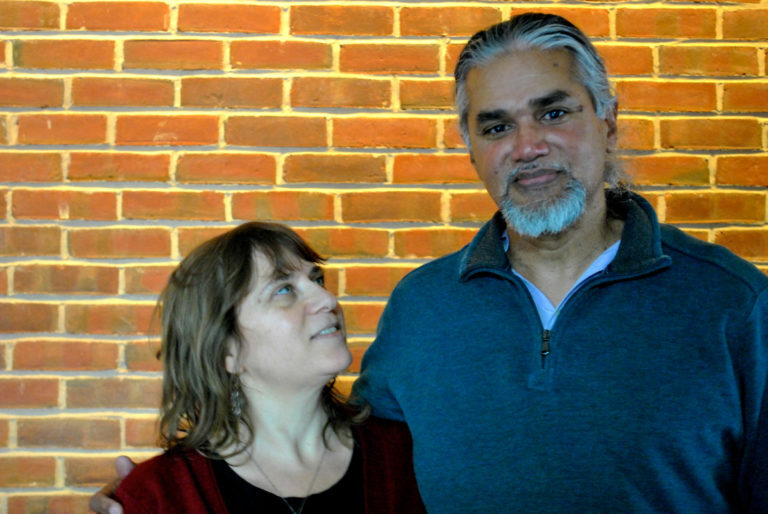 Photo (top): Ravi Ragbir, left, with his wife, Amy Gottlieb. Credit: Peter Rugh. 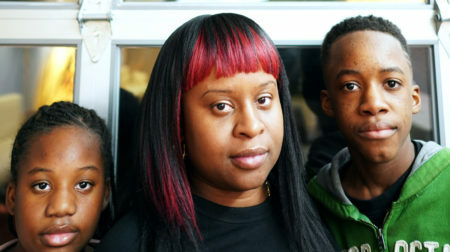 Their father was returned to Haiti. Now what?